Just like almost everyone else this time of year, our thoughts here at Blenheim Ginger Ale turn to one thing. The BIG GAME. The Big Game is right around the corner, and you have the Buffalo wings, pizza, chips and dip ready to go. You also have a 6 pack of your favorite beverage getting icy cold in the fridge. Yep, 6 tall frosty bottles of Blenheim Ginger Ale just waiting to be poured out and turned into a cocktail, or served straight up over ice. No ordinary glass is fit for your icy cold and fiery hot Good Ole Blenheim Ginger Ale. So what do you put your Old #3 into? We can’t think of too many things better than a customized Blenheim Ginger Ale glass. Since you’re already surfing the web reading this, we suggest you point your browser toward Etsy. Etsy is an online store that specializes in handmade crafts. There you will find the Bottlehood store that carries a line of uniquely handcrafted tumblers and vases. They have turned empty Blenheim Ginger Ale bottles into tumblers to hold your cocktail creations. These incredible artists from San Diego upcycle non-returnable glass bottles to help save the environment, and create beautiful art at the same time. Ok, now that the adults have their beverages in hand, how about the kids? Need something a little milder for the young ones? 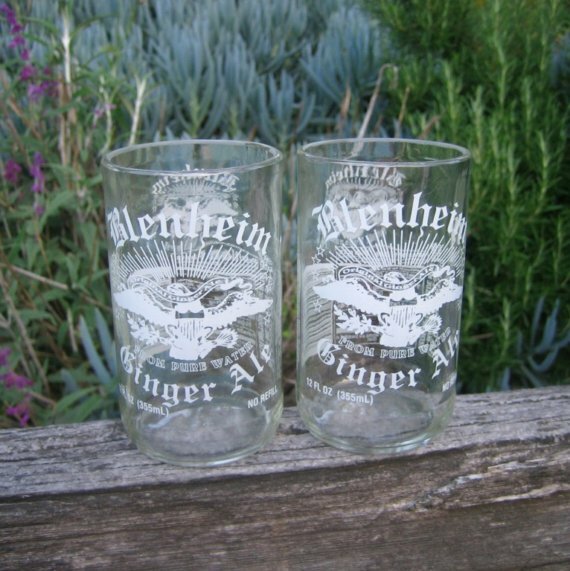 Once you have your new Blenheim Ginger Ale glass, fill it up about half way with your kid’s favorite Blenheim flavor and add a big scoop of vanilla ice cream. Then top your glass off with little more ginger ale for the tastiest ice cream float on the planet. It’s creamy, cool and spicy all at the same time. Kids will love a Blenheim Ginger Ale float to go with their pizza rolls. This great idea came from one of our fans on our official Blenheim Facebook page. We also can be found on Twitter. Everyone at Blenheim Ginger Ale and the entire Schafer family wish you much joy and prosperity in the New Year. This entry was posted on Tuesday, February 1st, 2011 at 1:50 am	and is filed under Drink Recipes, Fan Appreciation. You can follow any responses to this entry through the RSS 2.0 feed. You can leave a response, or trackback from your own site.